Foraminifera, or 'forams' as they are often called, are small marine creatures that build a delicate house (called 'test') from chalk. Although they resemble molluscs they are in fact single cellular protists, but they can be quite large for organisms with only one cell. The largest forams are more than 10 centimetres wide. The pyramids of Egypt are made of stone cantaining these creatures. The forams in this gallery are up to 2mm. and were collected from beaches around the Mediterranean sea. Some are fossils, some are recent bethnic living on the sea bed and others are recent but planktonic in life style, floating about in the upper seawater. The image on the right shows Rosalina globularis in darkfield illumination. This species is a good example of the distinct punctured shell that gave Foraminifera (which means 'bearer of little holes') their name. Through these pores they extend their long thread-like 'filopods' to capture prey. 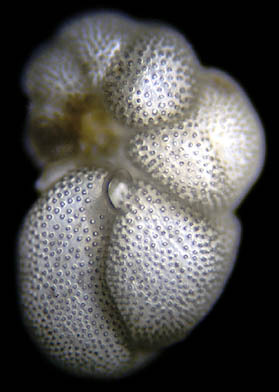 Several Micscape articles about forams can be found via the Micscape search page. In this gallery we tried to portray some of the common species of forams that can be found in the mediterranean region. These species are in fact best observed with a stereo microscope. Normally you would see them mounted as dry mounts. In order to make the images as they are shown in this gallery they were mounted in Canda Balsam in deep cells by Brian. Wim made a series of photomicrographs from these slides. Comments to the authors Comments to the author sent via our contacts page quoting page url plus : ('wegmond','')">Wim van Egmond and Comments to the author sent via our contacts page quoting page url plus : ('bdarnton','')">Brian Darnton are welcomed. Published in the March 2000 edition of Micscape Magazine.